The title of this beautiful anthem by Sergei Rachmaninoff translates to "No More War Please"
[While in prison], however, they stopped cutting Samson's hair after it was shaved off, and it began to grow again . One day the lords of the Philistines assembled to offer a great sacrifice to Dagon their god, and to rejoice, for they said, "Our god has given Samson our enemy into our hands." When the people saw him, they praised their god, for they said, "Dagon had given our enemy into our hands, The man who destroyed so much of our country, And killed so many of us." They were in such high spirits, that they said, "Call for Samson, that he may amuse us." 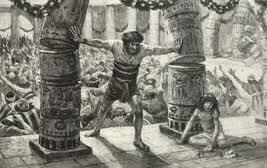 So they called for Samson from the prison and stood him between two main pillars of their temple. Then they teased him for their entertainment. Samson spoke to the boy who was holding his hand, and asked him, "Let me feel the pillars on which the house rests, so that I may lean against them." The building was crowded with men and women. All of the Philistine nobility were there. Even on the roof, there were 3,000 men and women enjoying the amusement that blind Samson gave them. But Samson called to the Lord and said, "O Lord God, please remember me. Let me be strengthened just one last time, O God, that I may take vengeance on the Philistines for putting out my eyes." Then he took hold of the two middle pillars on which the house rested, and braced himself against them, one with his right hand and the other with his left. And he cried, "Let me die with the Philistines!" And with that, he bent against the pillars with all his might, and the building collapsed, falling on top of the Philistine lords and all the people who were in it. And the Philistines he killed at his death were more than those he killed in his life. His brothers and all his father's household came down and took him, and buried him between Zorah and Eshtaol in the tomb of Manoah his father. He had judged Israel twenty years.